This nutrient-rich halwa is relatively low in calories and makes for a great dessert option for an Indian meal. Enjoy it as an occasional treat on festivals to satisfy your sweet tooth the healthy way. 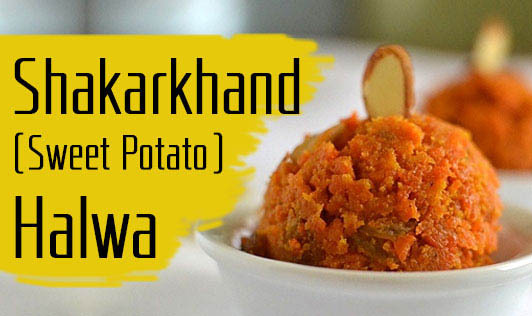 This delicious halwa can be served chilled or hot both. Mix saffron in a tablespoon of milk and keep aside. Clean and wash the sweet potatoes and cook them in a pressure cooker (4 to 5 whistles) or microwave them on high for 5 to 8 minutes. Cool, peel, and mash the potatoes and keep aside. Heat ghee in a nonstick pan, add the mashed sweet potatoes, and sauté on medium flame for 2 to 3 minutes. Add milk, ½ cup water, sugar, and cardamom, and simmer on low flame for 1 to 2 minutes. Ensure that the halwa has a little liquid remaining and it does not dry out completely. Add the saffron and chopped nuts. Mix well. Serve hot or refrigerate for 3 to 4 hours and serve chilled.